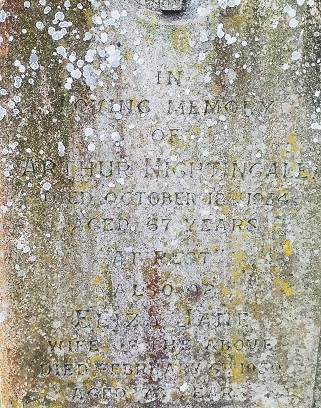 Arthur Nightingale from Didbrook sang The Broomfield Hill, The Lakes of Cool Finn, The Outlandish Knight, and The Unquiet Grave, to James Madison Carpenter between 1927 and 1934. Mrs Nightingale sang him Lady Maisry. Carpenter note: he learned this at Winchcombe 55 years ago. Arthur Nightingale’s father, John Nightingale, was born in Sedgeberrow, Worcestershire about 1836, the son of Jane Nightingale, a single woman. By 1851 he was working in Sedgeberrow as a servant in the house of William Teale, a 35 farmer of 120 acres employing 4 men from Wellborn Magna. On 22 March 1856 whilst working as a labourer he married Ann Davis from Laverton, the daughter of William and Mary Davis from Laverton. William Davis was also a labourer. Arthur Nightingale learned the song The Lakes of Cool Finn from his grandmother, Mary Davis of Laverton. John and Ann lived in Laverton and by 1861 John was working as a ‘house bailiff’ and they had three children all baptised in Buckland church, William John on 8 June 1856, Mary Ann on 5 September 1858 and Noah on 7 April 1861. Around 1864 they moved to Wormington and by 1871 they had three more children, Alice born about 1865, Arthur born about 1868 and Amelia born about 1870. Ann’s widowed mother was also living with them. They then moved to Didbrook where in 1881 John was working as a shepherd. Arthur’s father, John Nightingale. died in 1891 and his widowed mother, Ann, moved to Chandos Street, Winchcombe with Arthur and his brother, Noah, who were both working as general labourers. Arthur Nightingale married Eliza Jane Turbefield, who was born in Winchcombe, towards the end of 1896 in the Winchcombe Registration District and early the next year their first daughter, Mary Grace, was born. A son, William Arthur Fleming Nightingale, was born on 23 May 1900 and William was baptised in Winchcombe on 3 October 1901 when Arthur was working as a labourer. The family were then living in Hailes Street, Winchcombe. At that time Arthur’s brother John was living at 2 Chandos Street, Winchcombe with his family and Arthur’s brother Noah was living in Bull Lane, Winchcombe with his family both working as general labourers. By 1911 Arthur Nightingale was living in Silk Mill Lane, Winchcombe and he and Eliza had two further children, John Reginald born 20 June 1903 and Margaret Agnes Macpherson Nightingale born 15 or16 February 1906. Both children were baptised in Winchcombe on 30 March 1906. In 1911 the family were still living in Silk Mill Lane. Arthur was working as a timber filler at a timber merchant. His wife was working as a mill hand (rag sorter) at a paper mill (presumably at Postlip Mill) and their children were still living at home. In early 1912 Arthur and Eliza had another son, James Leslie Nightingale on 30 November 1911. Arthur Nightingale died in September 1934 in Cheltenham and his wife, Eliza died there in March 1950. 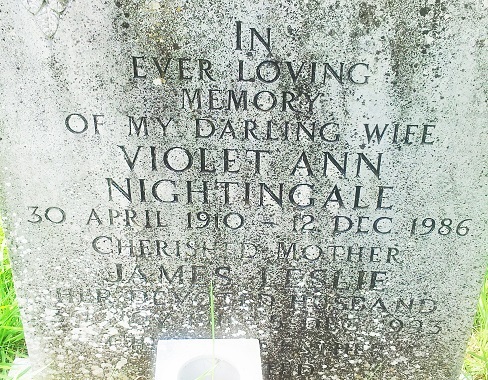 Arthur Nightingale’s son James Leslie Nightingale married Violet Ann L White in Cheltenham in 1931 according to the Nightingale Family Tree on Ancestry.com. They then had four children in Cheltenham, Donald Nightingale who was born in 1932 but died aged 7 in 1939, Doreen A. Nightingale born in 1945, Jean R. Nightingale born in 1938 and Sheila J. Nightingale born 1933. Doreen Nightingale married Geoffrey A. Bowles in Gloucester in 1975 according to the above family tree .on Ancestry.com. Jean R. Nightingale married Colin D Schofield in early 1959 in Cheltenham. Their probable children were Susan J. Schofield born in Cheltenham in 1959 and Mark D. Schofield born in Cheltenham in 1963. Sheila Nightingale married Douglas S. Jones in 1954 according to the above family tree. Their probable children were Graham D. Jones born in 1956 in Cheltenham and Marion Jones born in 1957 also in Cheltenham. James Leslie Nightingale died in 1993 in Cheltenham General Hospital and his wife, Violet Ann, died in 1986.